Members of work groups tend to feel similar emotions at any given time. Some reasons for this include the fact that emotions are contagious, these people tend to experience events simultaneously as a group, and they are all part of the same organizational and emotional ‘culture’. Shared positive affects (aka emotions) within a work group are linked to higher satisfaction, engagement, cooperation and performance, as well as less burn-out. On the other hand, shared negative emotions have the opposite linkages. The leader of a group can have a huge impact on the feelings that group members share, especially when the leader is charismatic. Of course, members of a team are not identical clones, so there is naturally some ‘affective diversity’ (individual differences in emotions), but if you’ve ever been part of a team, you’ve likely seen this sort of collective mood swing. With those swings come more (or less) productivity and satisfaction. Humans seem to be hardwired to pay more attention to the negative elements of our lives. After all, evolutionarily speaking, an early human was far better off paying attention to the risk of wild animal attack than on the pretty flowers. 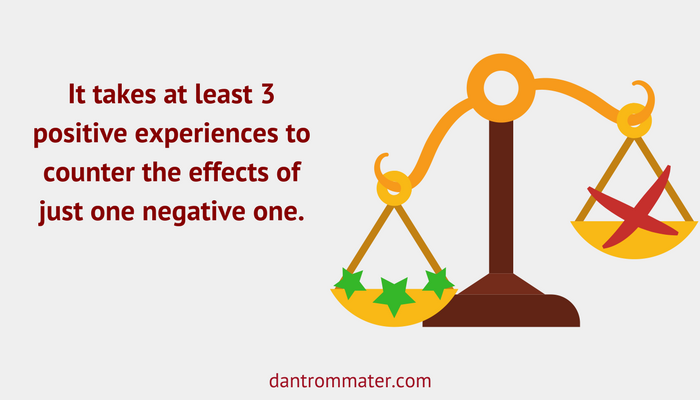 That propensity for the negative lives on, so much so that according to some research it takes at least 3 positive experiences to counter the effects of just one negative one. The Three Good Things exercise is an easy way to boost your positivity in just a few minutes a day. Also known as “What Went Well” or “Three Blessings”, it works by shifting your attention to the good stuff in your day, thereby raising your positivity ratio. The roots of this exercise go back a long, long time, but the modern version is usually credited to Dr. Martin Seligman of the University of Pennsylvania. It’s simple. At the end of each day you’ll write down 3 good things that happened and what you did to contribute to them happening. They don’t need to be huge successes or winfalls, in fact, most days you won’t have a big triumph to record. … a few sentences giving more detail about what happened. Who was there? What was said? What were the circumstances surrounding this good thing? … how you felt at the time. What emotions were you feeling at the moment this happened (and now, as you write about it)? … what did you do to contribute to this good thing happening? Joe and I sat down to talk about the new project over lunch. I had a chicken salad sandwich and a cup of coffee. We talked about the work that’s going well and the problems we’re having. I felt good about the meeting. We uncovered some new information on the project and found a way around that roadblock. Plus, the sandwich was delicious. And I notice that thinking back about the meeting makes me feel happy. I contributed to this good thing by reaching out to Joe to schedule the meeting. Plus, I had done some work beforehand so we’d have a few things to go over at the meeting. You’d repeat this process for the other 2 good things that happened each day. 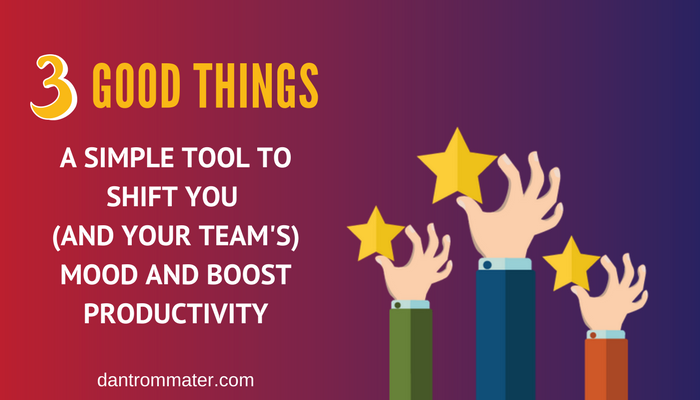 While you could also just think your way through this exercise, it’s been shown that actually writing them down increases the impact of this tool. I love this exercise! It helps you focus on the good things in your life that you might otherwise take for granted. It’s so simple and surprisingly powerful. Research has shown long-lasting positive effects for people who did Three Good Things once a day for only a week. That’s amazing! Just one week of writing down three good things that happened that day lead to six months of increased happiness! That is certainly time well spent. As a bonus, this exercise impacts self confidence and self efficacy (one’s belief in one’s ability to succeed in specific situations or accomplish a task) because it helps you realize your own role in the good things in your life. By praising your own processes, you’re positively affecting your mindset. I challenge you to try this for yourself for a week. It only takes a few minutes per day, but can have a big impact. See if you notice the difference in your own emotions, as well as the collective mood of those around you. I’d love to hear how it goes for you. Comment below or drop me a line at and tell me what you think. By the way, I get a bonus positivity boost from all of this because 3 is my favorite number. Maybe it’s because I was born on November 3, maybe it’s because I have 3 big sisters, and maybe it’s because of this song. I have enjoyed following your posts. At this time I am unable to follow your journaling group. Just have too many other things going on. Thankfully, all good things. Had thought maybe I could squeeze it in when I signed up, but no, not now. Sounds like all is going well with you professionally, and hope privately too. I turned 80 in September and am doing better all the time, both physically and emotionally, as well as enjoying my life. Keep up the good work, the world needs you.